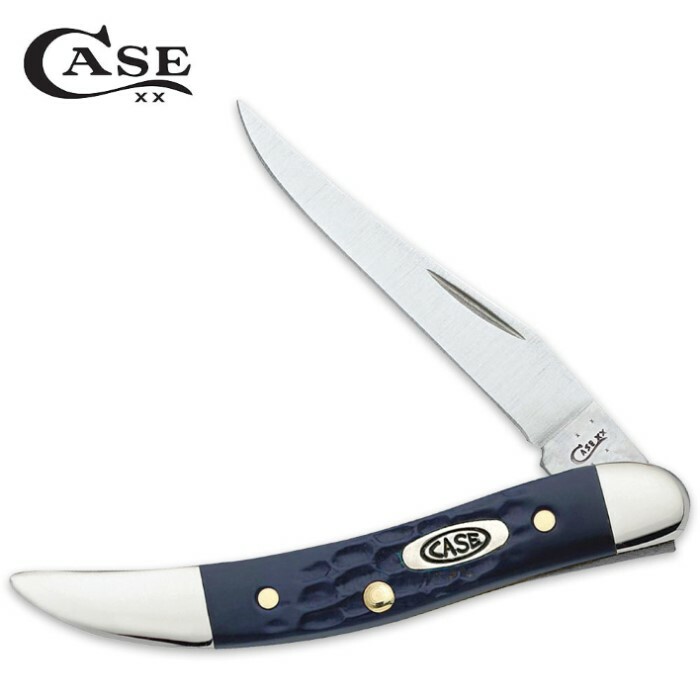 WR Case & Sons Navy Blue American Workman Small Texas Toothpick Pocket Knife | BUDK.com - Knives & Swords At The Lowest Prices! Featuring all the ruggedness and reliability you’ve come to expect from legendary blade builders Case, the American Workman Small Texas Toothpick Pocket Knife adds a touch of elegance and style to any knife collection with its stunning navy blue jigged synthetic handles. The fine detail in the handle is extraordinary, tastefully simple with a look and feel like fine alligator hide. In classic Case fashion, it resists chipping, scratching and other damage better than perhaps any handle in the industry. The jigging texture creates a bond with your hand that it simply unrivaled, and its feel improves with each polishing. And since it’s a Case, you know you’re getting blades with sharpness and durability second to none. Perfectly sized for fine cutting jobs and practically any day-to-day task you throw at it, the Small Texas Toothpick is 3” closed and features a stainless steel ground long clip point blade, carefully forged to last a lifetime and beyond. Like the WR Case Company itself, founded in 1889 by four brothers, the beautiful deep ocean blue American Workman Mini Texas Toothpick is sure to become a treasured family heirloom passed from generation to generation in your own family. You won't find lower prices on Case knives anywhere else, so go ahead and get two - one for yourself and one to gift! It's easy and painless on your wallet, and it's sure to be the present remembered by everyone!